Thai food is like Tim Burton's Pee Wee's Big Adventure; Lao food is like Tim Burton's Nightmare Before Christmas. The former -- a broad, brightly-colored, lighthearted romp -- put the director's quirky vision on the map, but it was still fully digestible to the general audience. By the time he created Jack Skellington, Burton's films were brooding, pitch-dark, and to some -- a little weird. Lao food is the same way. It's complicated, and takes a second, even a third look to appreciate the genius. The folks at Vientiane Restaurant in Garden Grove seem to know this. For those not quite ready for Lao food's eccentricities, the menu offers all the Thai staples (pad thai, et al). But those primed for funkier fare can dive headlong into Laos' home-grown cuisine -- one that, like other South East Asian countries not named "Thailand" or "Vietnam", is severely underrepresented in Orange County. 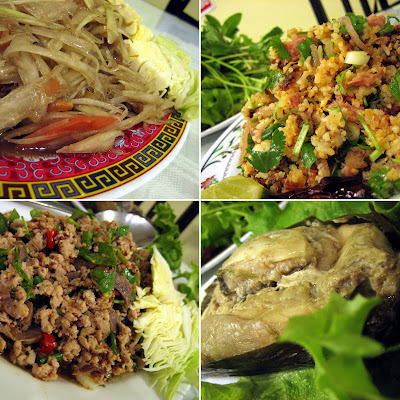 The low demand for Lao food in O.C. seems to reflect itself in the few seats the restaurant has. To say that it's tiny is not sufficient. The dining room is literally no bigger than a child's bedroom, and can hold no more than four parties at a time. In fact, when I was there, nine customers occupied all available tables. If you were the tenth, your choice was to do take-out or wait outside. In the food, you'll find depths of flavor with unmitigated intensity. And like my favorite goth-leaning film auteur, it's got a little bit of good, old-fashioned oddness. Some of this even bleeds over to the typical Thai restaurant favorite of chicken yellow curry ($6.99). In its murky, coconut-milk gravy, lurks layers of complex, coarsely-flavored spices and an indescribable jungle aura. You eat it with some sticky, glutinous rice ($3.00), which is served in a stout basket of woven reeds. The starch has the adhesive power of a thousand glue sticks. But unlike regular rice, it's not pasty -- an essential property because you are supposed to ball it up with your fingers. As you do, it doesn't gunk up your digits, even as you dunk it into food. It will sponge-up sauce and grab onto other bits of the meal like a charged electromagnet. Other dishes don't need rice, just your attention. Take for example, the green papaya salad ($4.99). At first whiff you'll smell something off-putting; the discernible stench of rot. But it's not the fish sauce (child's play for those familiar to nuoc mam), it's the shrimp paste -- a substance that apes the smell of sweaty feet and distills all the flavor potential of fermented crustaceans. It darkens the tart papaya shreds to a dirty shade of brown, and amplifies the eating experience like a Danny Elfman score to a Burton flick. For nam ($6.50), think of the crispy, burnt rice that sticks to the bottom of the pot. Now think of it as the base for a salad that also has chopped peanuts, unidentifiable morsels of pinkish meat, jellied pork skin, cilantro, and green onion. Imagine then the whole thing dressed in lime juice, chilies. Finally, roll it up inside a lettuce leaf with more herbs like basil and mint. Tell me if your mouth doesn't water. Same goes for the chicken larb ($4.99), which plays a lot like the Thai version, except that it has smokier notes and slices of something rubbery and gristly, which I can only guess is boiled beef tongue. The prize for tastiest (and also scariest) item goes to the mok pa ($3.50), which features a curried fish that might have been trout or catfish, hacked to pieces, shoved and steamed inside a banana leaf. The skin has the gelatinous quiver of pudding and the meat feels alien, for no other reason than that it's still attached to bone and cartilage. If a McDonald's Filet-O-Fish is a chlorinated, hotel swimming pool, this was like wading into a swamp; terrifying and thrilling at the same time -- just like the latter films of Tim Burton. In case you're wondering, I haven't seen Sweeney Todd, but I haven't tried Burmese food either. I'll save that analogy until then. Awesome analogy/review I'll think twice before hitting up and Laos eatery. Wow, you are very well-rounded Elmo! You both enjoy food and Tim Burton flicks! I am surprised that you didn't incorporate my favorite Tim Burton film, Charlie and the Chocolate Factory. Well, I liked Beetlejuice and Batman Returns. I think we could call Vietnamese food Charlie and the Chocolate Factory. This makes me really confused about whether Laos food is good or not. Your descriptions. Hmm. I'm guessing this food is delicious, but looks disgusting? Hey Elmo - Looks great! I'm a big fan of Nem Khao, though I must admit the super pungent Lao, or even Cambodian Papaya Salad gives me pause. Could care less about Tim Burton analogies. I am not sure if you are trying to say the food is good or bad? Yeah, it's good, but I put it at the side of acquired taste. Especially if you're not used to the funkier South East Asian ingredients. I like C&CF too. Completely slipped my mind. You're right though, that's another one of his that's uncharacteristically bright. Sorry, I didn't mean to be vague, but I did want to make sure that people knew what they were getting into. Those expecting diluted flavors will be put off. I did enjoy the Lao food, a lot, but I think a lot of other people (like my white friend) might not. I still don't know what that pink stuff was though. Maybe ham? I hear ya brother! You want to know whether this is a thumb up or down. I like that! Well, I liked the food. But my white friend didn't. And he's usually pretty adventurous. But again I liked it because it was different. I still don't prefer it over Thai Nakorn. Oh man! I love you Elmo! You always unearth the greatest finds. I haven't had Laotian food in ages! I loooove the curries. I always think of it as the heavily fish and shrimp sauce-laden versions my Thai favorites. Well, that's the easiest analogy I can think of, but I hope I don't offend someone with that. You know, because we're not all the same! BTW, there's a Thai/Burmese restaurant near me I've got on my "to-eat" list. If you ever want to check it out, I'll meet up with you! GREAT ending!. 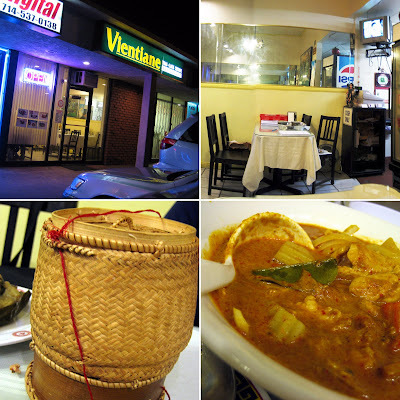 I've been to Vientiane--wasn't that impressed, because a much-better place is Dee-Dee Restaurant in Anaheim, which has all the dishes you described and more! I liked your analogies, although I never knew Burton did Pee Wee's Big Adventure. Mmmm, shrimp paste. Filipinos do something similar with green, unripe mangoes and bagoong. I've never had it, but I'm guessing the sour/salty combo is good. Not sure if crunchy and gelatinous are my cup of tea, LOL. Same here. Hope I don't offend any Laotians with my dumb analogies. Theirs is a complex cuisine that I'm only beginning to learn about. But Burmese! Are you talking about Golden Triangle in Whittier? I'm dying to try that place, but it's too darned far! That was the other one I wanted to check out, but alas, I went with Vientiane, the one that's closer. But in light of your experience with Dee-Dee (and the fact that I liked Vientiane), that just means that I've only got one way to go: Up! We, Indonesians, also do something with shrimp paste and veggies called rujak...now that's a salad! But that bagoong is a pungent beast. I only have the guts to try it in pinakbet, in which it is magical. Yeah, it's um...even slimier than I described. I just ate the leftovers and it had become even more jelly-fied. It was better fresh. Heh, I meant even further away - Yoma on Garvey in Monterey Park. But I know you go up to the SGV sometimes? I also need to revisit Hot Stuff in San Gabriel. It's Burmese-owned but Asian and fusion cuisine, so only a handful of Burmese dishes. The fermented tea leaf salad I had there was sooooo good. Lemme know if you're interested in meeting up. I'm not in any rush. You know even though Whittier is technically closer to Irvine than SGV, I don't consider SGV all that far away. And you're right. I find myself travelling up there often (was there last week for the new Din Tai Fung). I'll give you a holler when I make my next trip. Maybe I can grab Chubbypanda and you can corral Henry Chan! Hey elmo, thanks for the write-up. Finally something about laotian food. If this is the same place my dad took me to, I really enjoyed it. great blue crab papaya salad (not sour like Thailand's version) and beef larb. so good. I've never had Lao cuisine food. I think I'd like to try it on my our trip out there. You really do have almost every country represented in the culinary sense over there, d on't you? Hi Elmo - I have been a loyal reader of your blog for some time now, and I have decided that this would be a perfect time to comment. I am a "white girl" married to a Hmong man, and Lao food is definitely close to our hearts (and stomachs!). I am glad that you were able to try some nam, although it is an acquired taste. By the way, the "pink stuff" in the nam is sour pickled pork, which is pretty much like pork "ceviche" (the sour flavors 'cook' the meat). It is available at most Asian grocery stores. Lastly, it seems that we are very similar in our tastes (and lifestyles). From what I gather, we are close to the same age, and my husband and I live in Irvine as well, so, who knows? We might bump into each other some day, as we also love to explore different cuisines. See ya around! Henry's in Asia until June. Sounds like the naem is like VNese nem chua (pickled ground pork with shredded pork skin). It's bright pink like Spam. AAAH. I kind of suspected that it was ham. I actually did a Google search before writing this post, but I wasn't sure. Thanks for the link. Since there are only two Laotian places in O.C., the odds are that you probably did eat at this one. I should've tried the blue crab papaya salad too, dang it! Looks like you've been busy doing some recruiting on other blogs too. You should take a break and have some Lao food! LOL! Guilty and lucky as charged. Judging by your adventurous palate (you like DURIAN) Lao food's right up your alley! Thanks for commenting! You know what? I'm sure we have run into each other. I'm usually trolling around restaurants and other places taking pictures of what I eat. And since I rarely cook, I do this a lot. If you saw a guy doing that recently, that was probably me. Thanks for the reminder of how good Laotian food is. At the nail shop a few years back, my Laotian employee brought in some fantastic dishes that blew away the whole Vietnamese staff. The Viet staff thought Laotian food was just a copy cat of Viet food (except for me cuz I knew nothing about Lao food). Boy, did she prove them all wrong. Though there were some similarities, the dishes she brought were uniquely Loas and delicious. She left a few years later to pursue and continue her culinary interests...maybe this could be her? I'll check it out! That'd be cool if it was your employee who started it. I saw the lady that was cooking it. She came out to check if everything was alright. She looked to be about in her early 60s. I still don't prefer it over Thai Nakorn. I was going to tip you off to the best Mexican food in OC (yeah, it's in Santa Ana, but in a Mex suburban neighborhood, not downtown), but your comment above gives me pause. Thai Nakorn is very good but doesn't come close to Vientiane. We went a few days after reading your review, and just laughed during the entire meal at how good it was. We go to Little Saigon/Santa Ana almost every weekend to check out different spots or hit our regular favorites. Even the best locations rarely have this level of direct preparation. There's a pho place that comes close, in the sense that the dad is in the back while the wife/daughter combo handles the orders/payment. It too has the requisite 'parents can't speak English' so their Americanized kids handle the interface. Thanx for the tip off. Thanks for sharing! I'm glad you enjoyed it and was able to observe how everything was prepared from scratch. I agree. It does make a difference. But why hold back on the Mexican tip? Don't be hatin' cause I said I prefered Thai Nakorn more. ;-) *WINK*! We can't all have the same opinion, right? We aren't Borgs. (No I'm not a Trekker, but my friends are). Anyways, I'm still happy you tried Vientiane. I'm an advocate of mom-n-pops like this one and Thai Nakorn. Elmo, good job w/ this review! Great write up. Definitely not the fusion food you commonly find. Descriptions are a bit humorous but I guess if I had to describe American chili, I don't know how I could give it justice either.